Should you be using hashtags in Instagram? Hashtags make your posts more searchable - it means that your ideal paying customer can find you - that means more followers, more likes and hopefully more sales! How many hashtags are allowed? You can have up to 30 hashtags on each post. Where should I post my instagram hashtags? You might have seen people posting their hashtags in the first comment. This works for a number of reasons. It gives you more space to write your caption. It looks tidier. And if you want to cross-post to your Facebook business page you won’t end up with a messy Facebook post full of hashtags that aren’t used on Facebook. What about Instagram banning hashtags? Well this may be an urban myth! I’ve just spent time on a site claiming they know all the banned hashtags - but when I did a search they are all in still in use. The argument goes that as Instagram doesn’t allow adult content, if a certain hashtag gets associated with adult content it gets banned. #adultlife was supposedly banned - but it was still there when I looked as large as life! How can I check which hashtags have been banned? Click the explore ‘magnifying glass’ button and type in your hashtag - if no search results come up then it’s banned! Can I edit my instagram hashtags? If you’ve added them in the first comment you’ll need to delete the first comment and start again. Do I need to use multiple hashtag lists? A few years ago there was a lot of talk about the Instagram Shadow Ban - I think it turned out to be another of those urban myths. I’ve been checking out accounts with really large likes of their posts and they mostly alternate between 2 really good hashtag lists. Where can I find popular instagram hashtags? There are lots of apps that can help - HishHash is one. Or check out hastagify online. Or alternatively I will do searches on desktop instagram and then curate my own lists copying and pasting the best into google keep. I can then copy from my google keep app on my phone! Learn how to beat the dreaded algorithm and ace it on facebook! 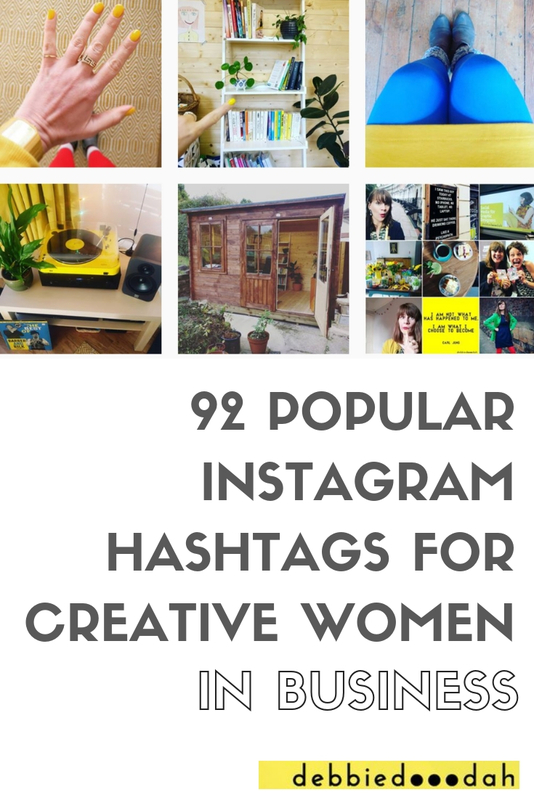 Hashtags for Creative women in business! Get more help with your Instagram strategy!